As I sat down to write this blog post, I asked myself, “what is the purpose of this blog? Is it to update friends and family of our whereabouts? Provide tips and tricks for future travelers? Share insights into the cities and towns we visit? What should I really be writing about here?” As I tried to answer this, I remembered that it really doesn’t matter why, because in the end, the purpose of writing for me has always been to reflect on my experiences, both while writing and in the future when I read back on past memories. So, at the risk of being cliché or unthoughtful, I’m simply going to do just that: reflect on the last few days and see where the words take me. Outside of Irene + Yves’ apartment in San Fransisco, our first morning riding together! 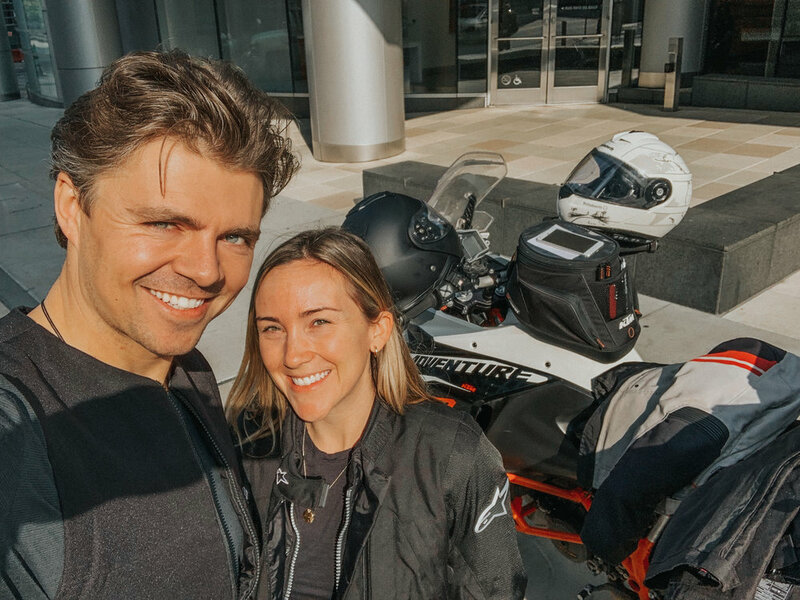 On Monday November 19th, Josh and I straddled the KTM and headed south from San Francisco. As we vacated the city, I looked all around me and saw hundreds of homes and buildings, hillsides and trees, and the open road ahead. For weeks, people had been asking me how I felt about the trip. I never knew how to answer. 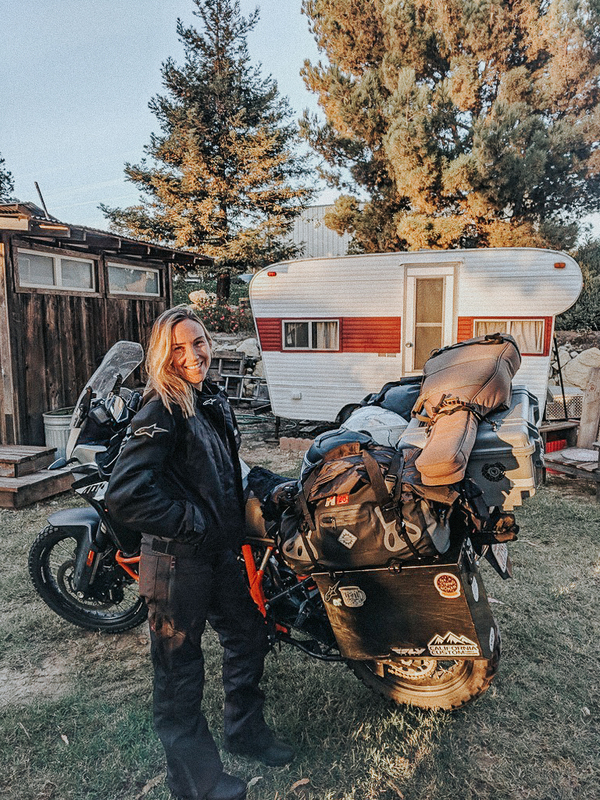 I suspected I would know how I felt once I got on the motorcycle, and anxiously, I awaited that moment to really understand how I truly felt. I was right. As we made our way further south, we hugged the northern California coastline on Pacific Highway 1, a single-lane highway with trees in lieu of post-lights and seagulls as our passengers. We crescendoed over hillsides, twisting past salt-water smells and the cliffsides below. With every passing hour, the landscape changed: from prairie-like flatlands to dry desert scenes, the California coast morphed before my eyes. I never realized how diverse one state could be, and how quickly the geography could change. As the smell of salt-water faded into manure, we traversed into central California, which appeared to be an agricultural hub. As the days rolled on, we had collected several hundred miles and stayed in a new place every night: Monterrey, Arroyo Grande, Los Angeles, and finally, San Diego. By the time we reached San Diego, we felt victorious: this was the most riding we would likely be doing the entire trip, as we planned to only ride once every few days, and at most 120 miles at a time. Each of the past four days consisted of 100 miles at least, and we rode every single day. I had no idea how exhausting it was riding, and we needed to stop every 30 minutes or so to stretch our legs and relieve our backs. 100 miles of riding takes us approximately 3 hours, and by the end of each day we were beat. Our hostel in Ensenada, aptly named after a city that is 1,000 miles south of here. Upon arrival in Ensenada, it was clear I had set my expectations outside the parameter of what this city is. I pictured white sandy beaches, swimming in the ocean, beers at the hostel bar, and travelers abound. Au contraire, (my French is better than my Spanish, I’ve slipped a few times already), the center of this city is blocks inland from the water’s edge and boasts tourist bars and dozens of Farmacias (Xanax, Painkillers, Cialas anyone?). The coastline is somewhat barren, save a few horse riders and a handful of mariachi bands. The city’s history, I’ve learned, revolves around the seaside being a port, rather than a surf or swim destination. Our hostel is a 30-minute walk (or three-dollar Uber, yes, they have Uber) from El Centro, and it has no bar or social scene to speak of. I was disappointed at first: “This is not what I expected. Where are the other travelers? Why is it so cold and windy? What is there to do here? What the hell are we doing?” And now, with the words on the page (ok, screen), I’m realizing that, no, this is not what I expected. This is not what I planned for. And yet, does that make it any less of an adventure? Does that make it any less of a learning opportunity? Will I not only be disappointed, but also pleasantly surprised? Absolutely. Already we have met locals who are hospitable and kind, helping us find vegan food options and suggestions for cities to visit. We desperately needed a few days of down time, and in a city with few recreational activities and sights, we have the opportunity to use the hostel’s accommodations and internet to catch up on rest and research. The roof of our Ensenada hostel. Now, sitting on the rooftop of our hostel, reflecting on the last week and looking ahead to what’s to come, I feel again the empowerment and freedom that I did on that first day we rode. Nothing about what we are doing will be perfect. Nothing will ever be what we expect, and at times that may be frustrating or exhilarating. And there’s no way to skip over any of it—the inter and extra-personal feelings, the geographical and social landscapes, the losses and gains. Each of those parts make up the holistic endeavor we’re embarking upon. I’m not going to miss a thing.